�My wish to expand my business and increase my monthly income has come true! Business is Booming with Big Boons Every Week. Now that I know this works, I am passionate to share with you.� Nancy Grace Rosen, M.C., M.Ed. completed 12 days before Christmas! Join me on a complimentary call Wed. Sept. 29th at 8pm est! A Wish Can Change Your Life lays out the essential tools or strategies for attaining our worldly goals while simultaneously fostering spiritual enrichment and peace of mind. 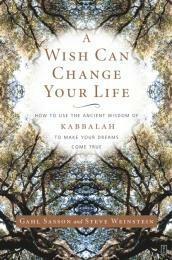 This book shows you how to tap the archetypal energies of the Kabbalistic Tree of Life-the eternal structure that created and animates everything in the universe-to fulfill any wish, whether it is for material gain (a new car, a higher salary), personal improvement and pleasure (weight loss, a more creative career, heightened intimacy with a partner), or a life-changing message from God. Each week we will gather together on the phone to begin each week of the spheres of the tree of life as our structure to make our dreams come true. We will chant, meditate, visualize, and share our wishes aloud, the magical synchronicitities, ahas, blessings during our wish community for one hour a week. A complimentary call on Wednesday, September 29 at 8 pm est is my gift to you to consider if you want to participate with us for this first round of wishes! I am available to share with you how my current wish has come true as I complete the 10th Sphere of Kingdom. Please join us on FB page and you are welcome to give me a call or email and let me know you are in our circle of wishers as soon as possible. Appreciate having payments in by Oct. 1. You can pay via paypal weekly $10, or save with one pymt of $88 by Oct. 1.